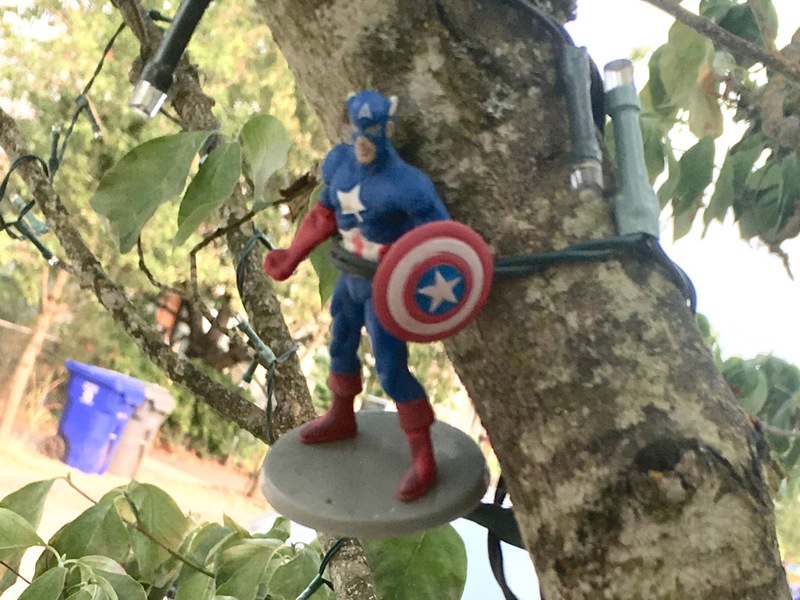 While house sitting in the Foster-Powell neighborhood this summer I became fascinated with what looks like a grass-roots campaign spearheaded by a local business taking on the mighty City of Portland. The store caught my interest when I was walking toward it on Foster Road. I was experiencing the neighborhood for the first time. 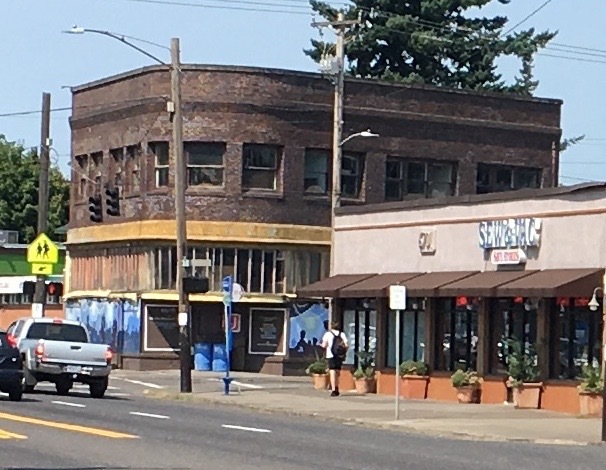 As I walked, I soaked in the area’s atmosphere, looking over the businesses, the side-streets, walking past restaurants and then I saw a building with murals. These were sure to be scenes of old Portland, I thought. 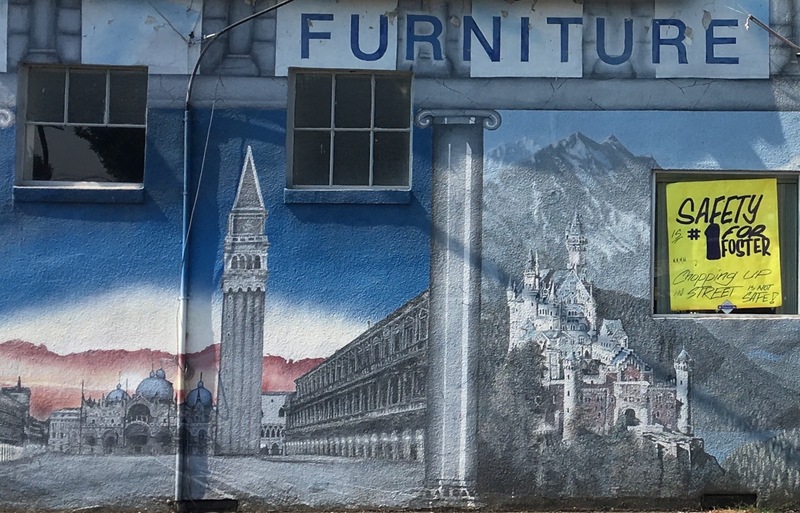 When I was close enough I saw that the murals were of a tower and castle which made sense given the business name EuroClassic Furniture. I presented information about my confusion for the Save Foster Road campaign a couple of posts ago. I was concerned about the area with some of the buildings appearing shabby even as I noticed new life in the places I’d passed. 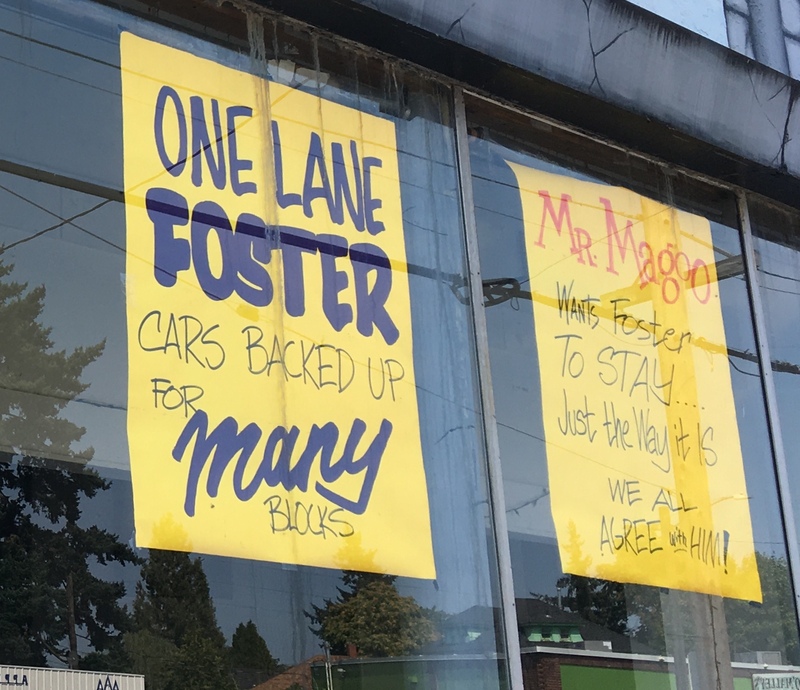 The subtitle of the banner declared the cause: SAVE FOSTER and Keep 4 Driving Lanes. 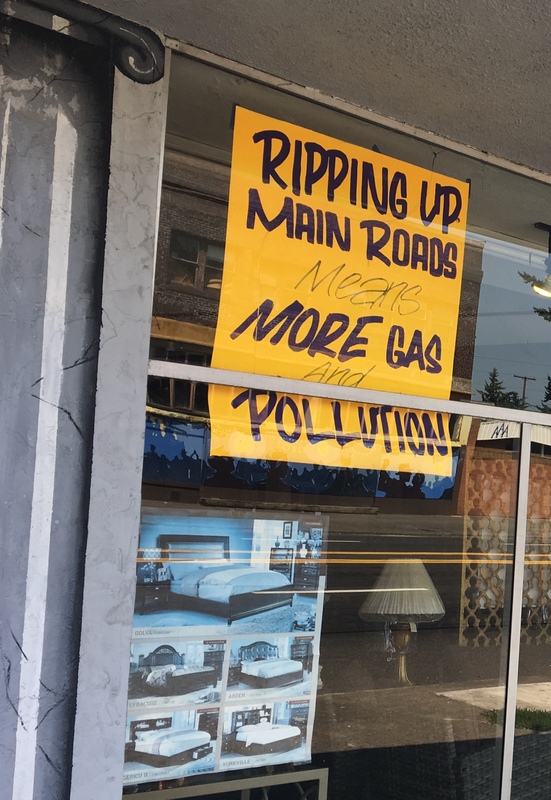 Window posters explain that the project is a waste of gas tax money and will “mess up” Foster Road requiring more fuel for cars stuck in traffic back ups while increasing pollution in the area. Another poster warns how jammed traffic will get. Cars will be “backed up for many blocks,” it says. More signs beg for a compromise asking the city to make Foster Road safe without inconveniencing the people who drive on it. Construction was scheduled to happen way back in 2016 but hasn’t happened yet. It looks like it’s now scheduled for the spring of 2018. 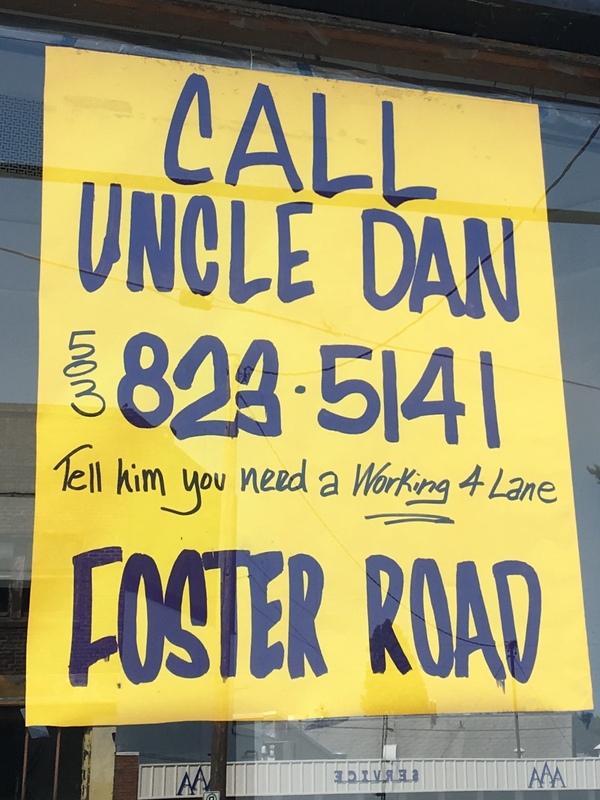 It’s not too late to call Uncle Dan. 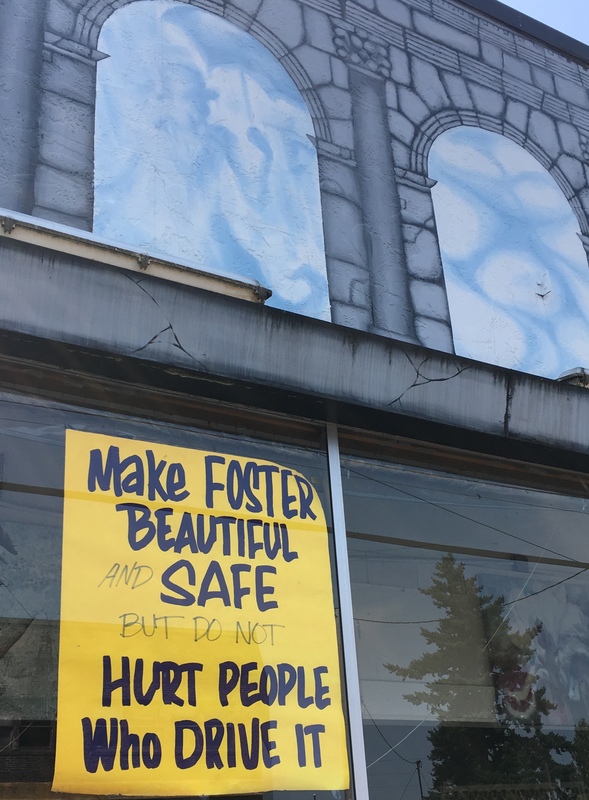 I was walking down Foster Road this summer during a house/dog sitting gig when I saw a large banner on the side of a store. 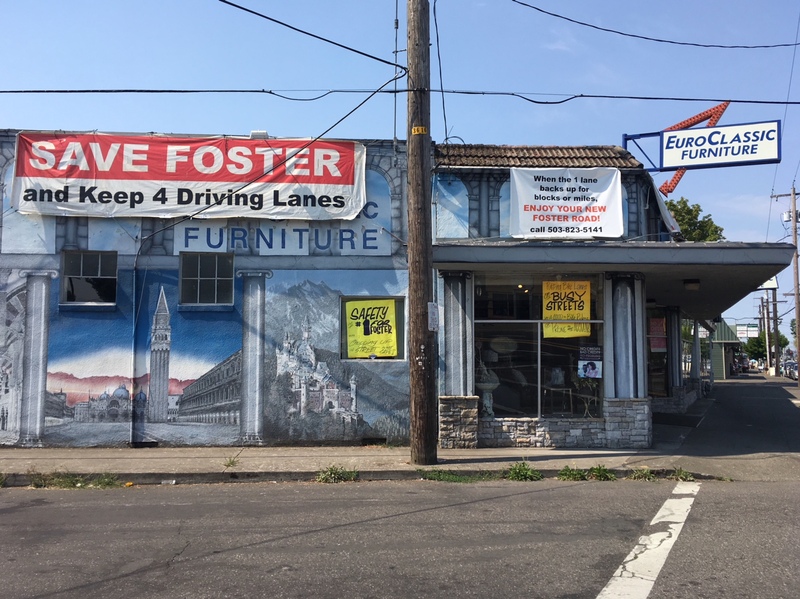 What I could see as I approached read: Save Foster Road. 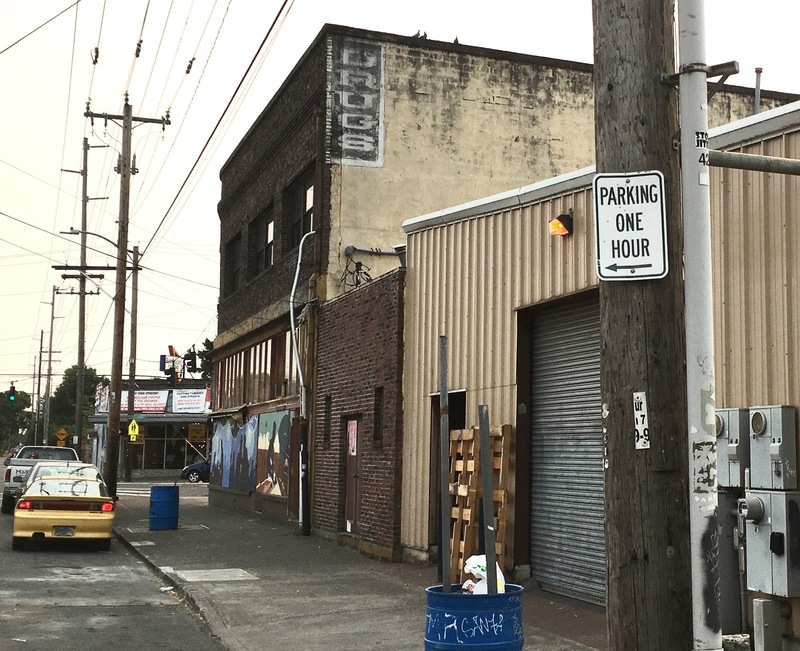 The buildings in the area appeared run down so I concluded that the sign was a plea to bring attention to the area. The structure that I later learned was the Pharmacy building caught my eye. I admired the curve of the architecture and I could tell it was historical but it felt abandoned. The Pharmacy building from the other side of the street. When I reached the banner, I realized Save Foster Road was a different campaign from what I had assumed. I won’t get into details as I plan to visit the topic in a future post. I had forgotten about the building when I was writing posts for the Foster Files. 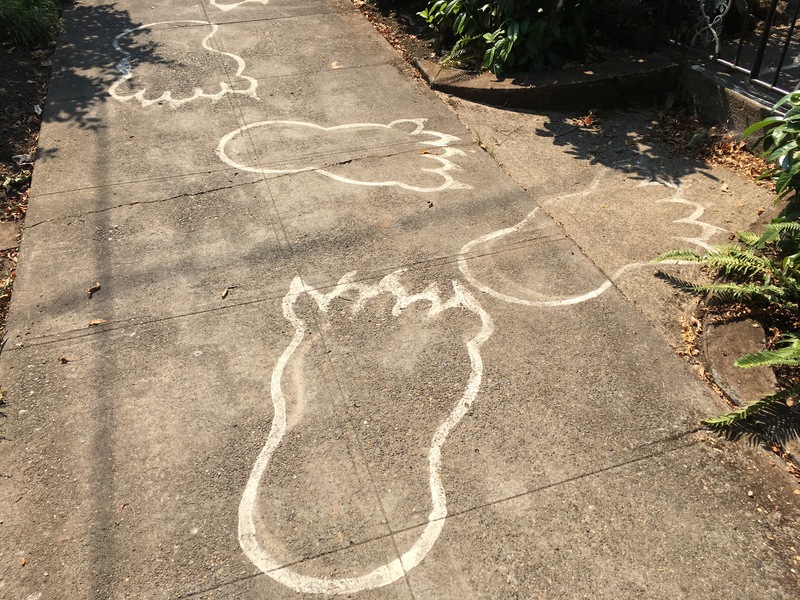 I had been immersed in sidewalk paintings and art trees in the neighborhood but the Pharmacy came back into my consciousness when I saw a photograph posted on the Hidden Portland for the Curious group on Facebook. Jason Pedegana, an illustrator and designer who runs a Facebook site with tons of historical photos, swooped in with information and more photos. The building came alive in my imagination. I saw it in its heyday and sensed its place as the hub of the neighborhood. 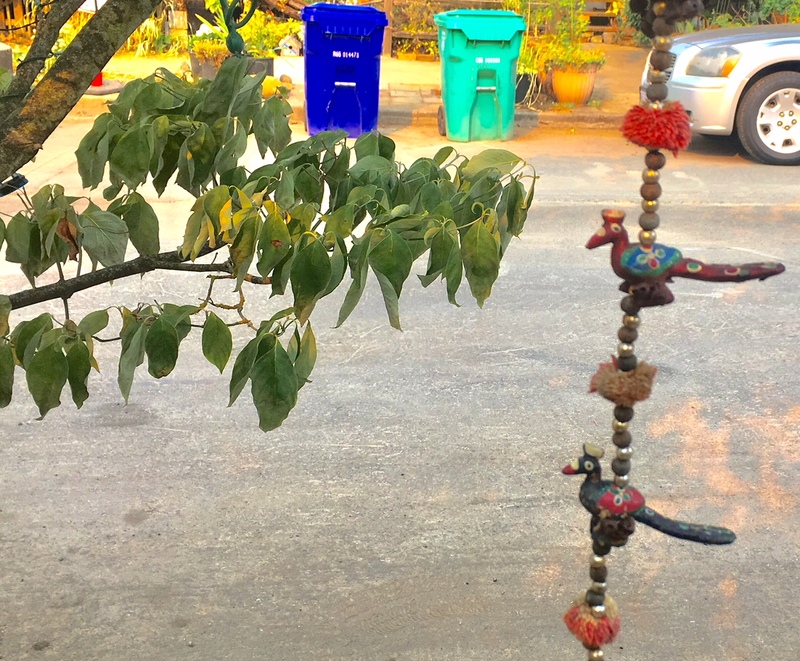 For a moment it wasn’t suspended in the stasis and decay that I had perceived from the other side of the street. The Phoenix in its’ heyday. 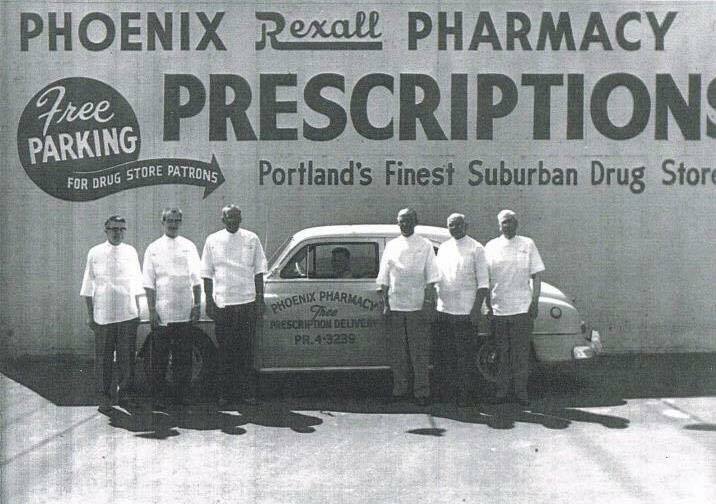 “The roughly 7500 square foot building constructed in 1922, was once home to the Phoenix Pharmacy. Built, owned, and operated by John Leach who lived with his wife on what is now the Leach Botanical Gardens, the pharmacy was centered at the core of the community, considered a gem, and attracted many people to the area. It was actually RE-built by Leach, as the previous owner had tried to burn it down, twice. Hence the name “Phoenix”. 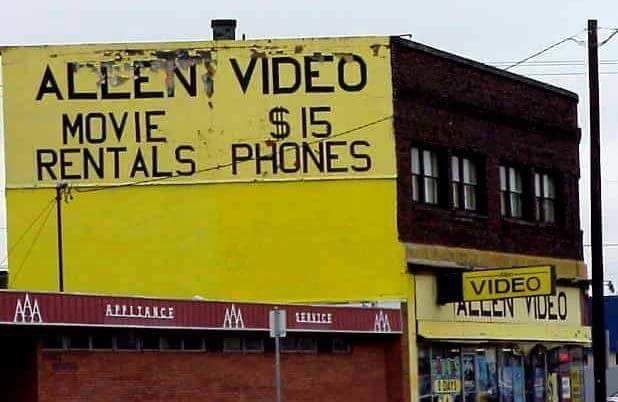 In the glory days of VHS. People chimed in with comments and a more complete story of the building formed through descriptions of past tenants, a doctor who had an office in the building, a video store that sold phones which seemed to be one of the last tenants and there was a mention of the second floor having two apartments. Other comments revealed that Buck Froman owns the building. If you ever need an in-person, oral history of the place you can talk to him at his stove shop a couple of buildings down. I asked the person we were house sitting for about the Pharmacy building when he returned. He told me the building had been unoccupied since he moved to the area in 2004. I felt an emptiness hearing that. My urban idealism wants cool buildings to find new life even when circumstances make it challenging. It’s understandable that renovation costs for seismic upgrades, wiring and plumbing mean are potentially prohibitive to attract a tenant. There is plenty of behind the scenes activity going on to preserve the building. A Facebook group, Foster the Phoenix, is devoted to these efforts. Someone associated with the group commented that the city has been involved in looking for ways to get the building back to it’s former glory. A mural was added to the first floor offering a sense that people are looking out for the building. A ghost sign haunts the back. I have to admit I’m weirdly nostalgic for things I’ve never experienced in Portland, real street cars, old movie theaters and unique, classic buildings. 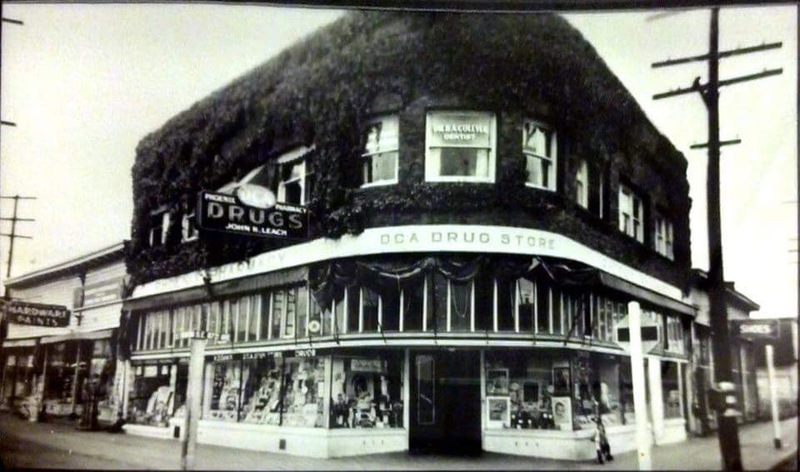 These days most drug stores are part of a corporate chain so I appreciated the history of this pharmacy that thrived with a staff of happy pharmacists. The story goes beyond Leach’s ability to run a successful business because of the legacy he left behind with his botanical garden. I’m hoping his Phoenix Pharmacy rises again. The photographs, with the exception of the first and last that appear in this post, are from the City of Portland Archive. Thanks goes to J. Pedegana for his historical input and for bringing photos and this subject matter to my attention. I would have sought more information from him but I ran out of time. To begin this series I must be upfront about being a transplant. It’s may be obvious. With all the other people who have moved here it’s not necessarily a bad thing. 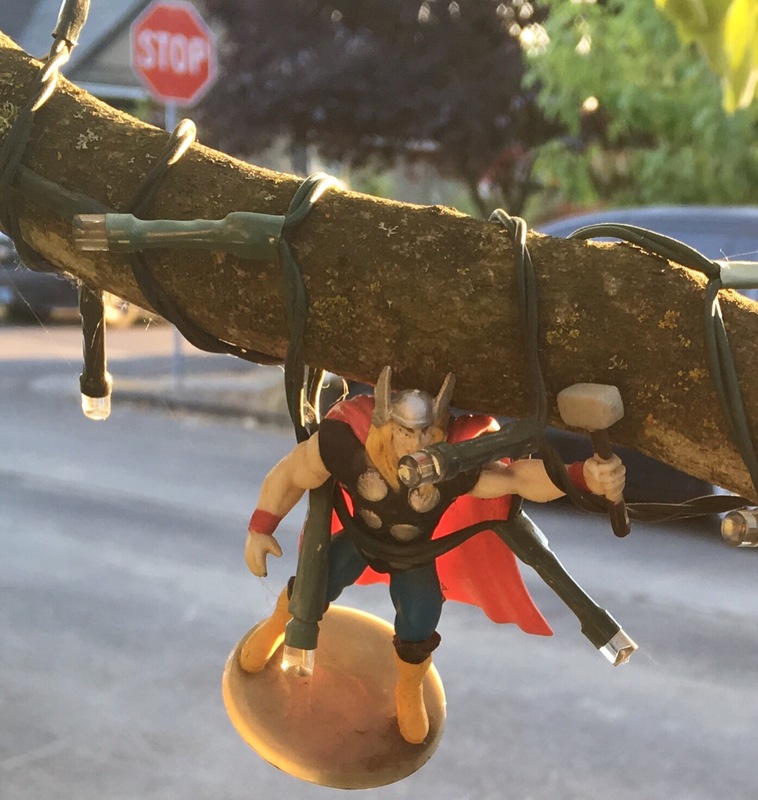 My ten years of living in Portland feels like a badge of honor. It takes the sting out of being a newcomer because I’ve hung on and I’ve lived a bit of local history. I write out of my interest in Portland and the opportunity it presents to make discoveries and learn the history of the area. The transplant comment came from someone on Facebook. It felt like it was alluding to cluelessness on my part. All I had done was write about Portland’s Liberty Bell. I discovered it’s existence years after living here. The Liberty Bell was a new discovery for me. I couldn’t figure out why it took me so long to stumble upon it. 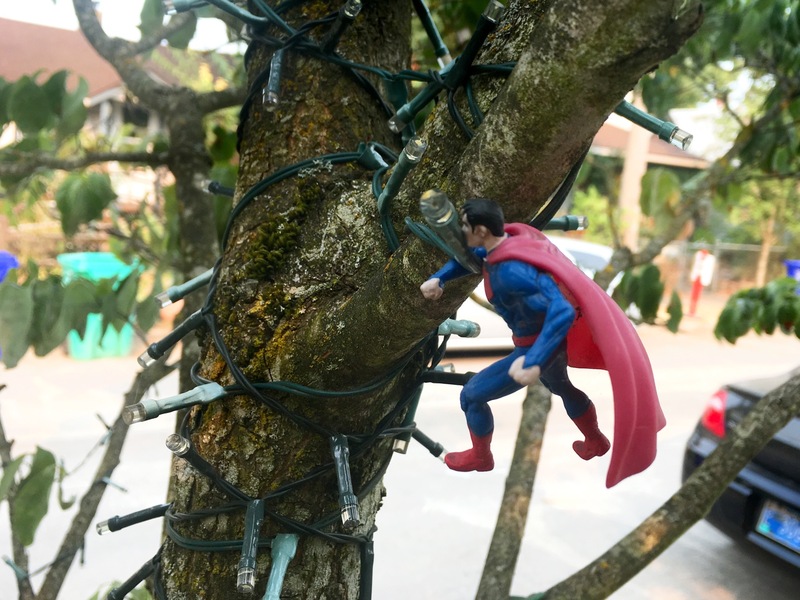 The thing was hidden in plain sight. 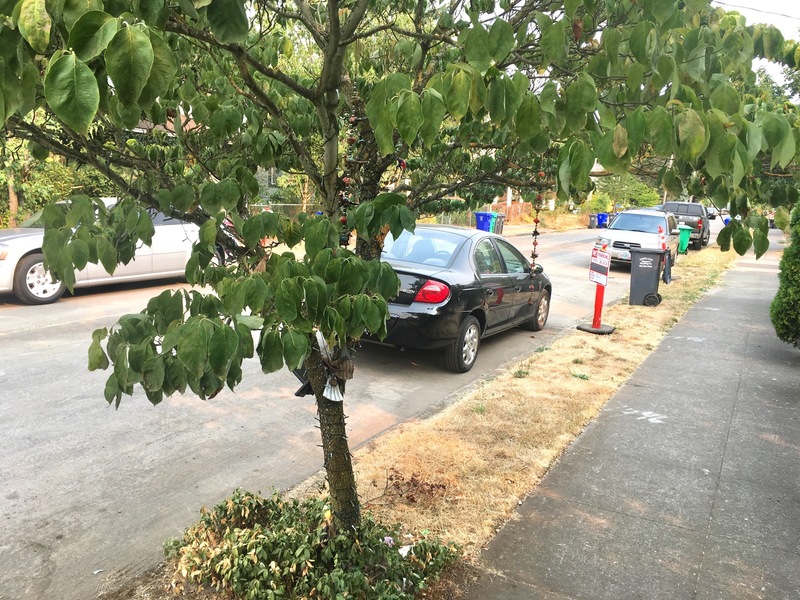 One of my recent discoveries has been SE Foster Road between 50th and 72th Avenues. My phone tells me this is part of the Mt. Scott-Arleta and Foster-Powell neighborhoods. I had not explored this part of Portland before visiting some friends living in this area with an out-of-town guest. While driving through this section of town to get to the Gorge this summer, I had a look around. There were run down buildings, different businesses and restaurants–a part of the city I was experiencing for the first time. Weeks later I got a chance to explore the area when I dog/house sat in a house off Powell Boulevard. The foot prints arrived out of nowhere. 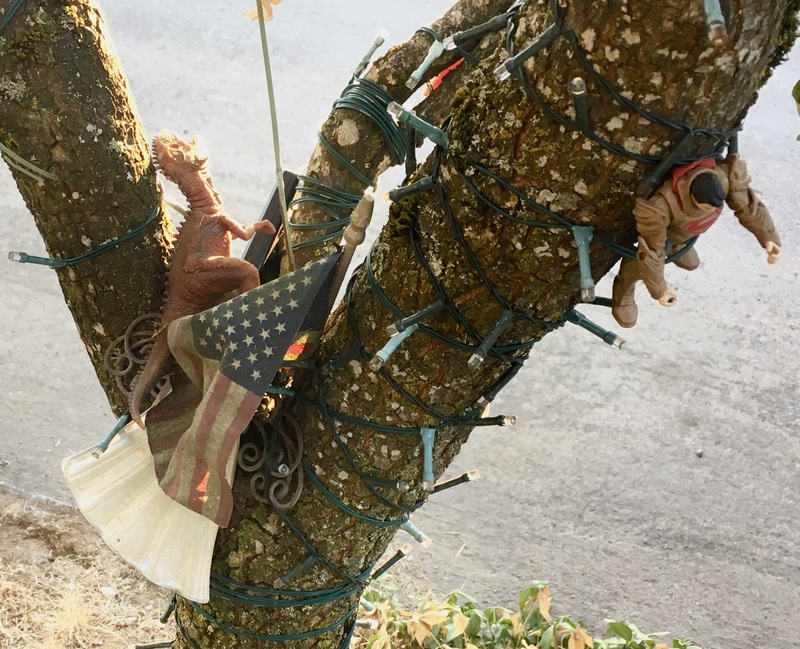 They were spotted on SE 72nd Avenue heading towards Foster Road from Powell Boulevard. The prints were noteworthy for their uniformity and being more artistic than realistic. Visually they seemed to be blaring out as if something from an out-of-this-world wilderness had visited the area. Nothing breaks up a dog walk like giant foot prints. Most sidewalks are undecorated, dull concrete. I stopped, took in the oversized, clawed images, grabbed a few pictures and moved on. The foot prints brought me a moment of brief joy and entertainment. Someone jazzed things up around this neighborhood. 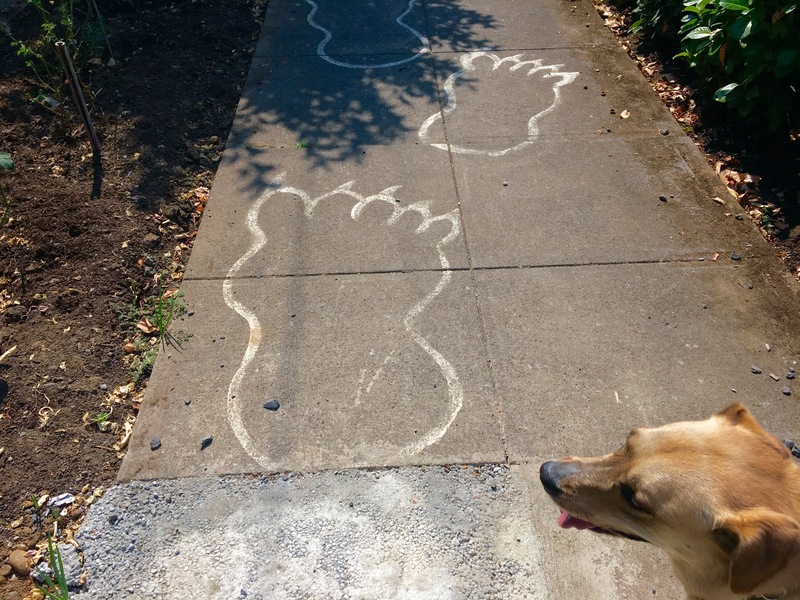 I couldn’t tell if this was a tribute to Bigfoot hunters or if it spoofed them. An argument could be made that it has nothing to do with Bigfoot. Then again a Bigfoot expert could tell me if Bigfoot prints reveal long toenails and yeah, of course whether these are authentic. 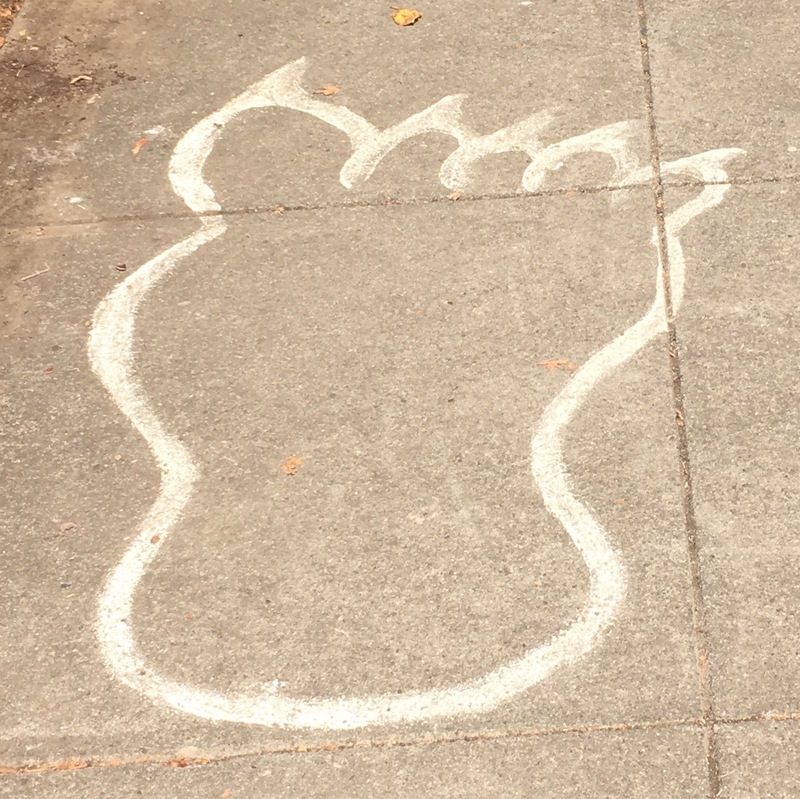 The image of any big feet makes me think of only one thing–a big foot. It can’t be simpler. I’d have to be a biologist to determine if the prints were specific to an ancient species of some sort. It’s possible another type of statement entirely is being made. The prints congregate from two directions, mingle together then head under a chained and padlocked gate. One always has to wonder why research for the blog posts on the Portland Orbit is rare. Where is the investigative reporting, the knocking on doors which in this case would have involved high jumping a gate? In this situation it is obvious. Initially, I didn’t notice the locked gate. It was revealed in one of my photos. 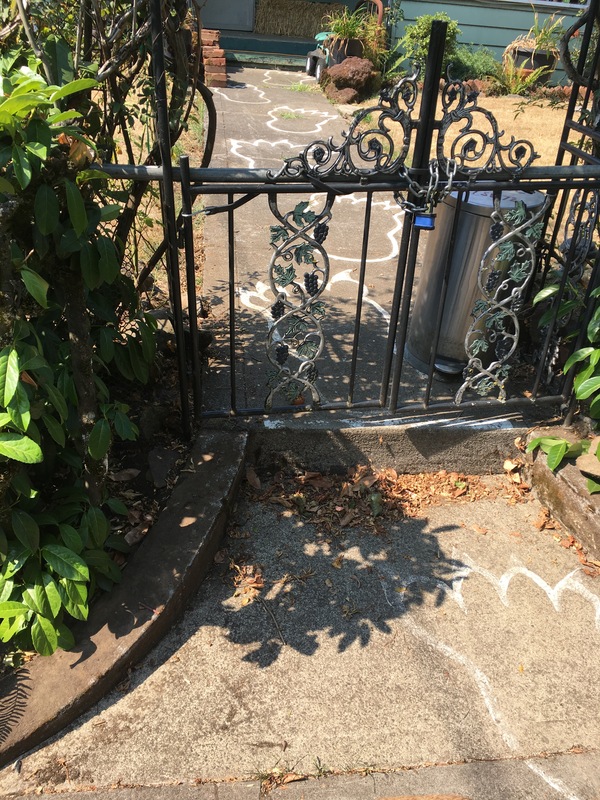 If I had charged towards the house to get answers and the story behind the prints, I would have been stopped in my tracks by that locked gate. Besides I was doing my dog walking duty at the time. I would also admit to being uncomfortable with the possibility that whatever made those foot prints could be real and living in the house. 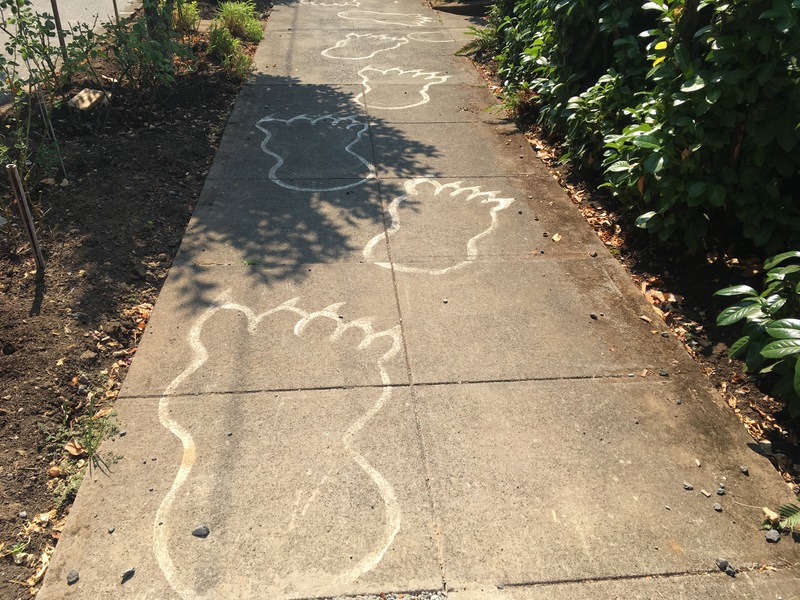 I was at risk of confronting a big footed being but it makes more sense that the work was done by friendly, foot print makers, at least I’d want to believe they’d be good natured and fun spirited. It’s more of the attitude that’s reflected by the whimsical nature of the foot prints. It is possible that someday I may get a lead on the story behind the prints. In fact, I rely on sleuths and the hope that there is someone out there who knows more than me and can provide me with answers that I can pass on in another post. But hope isn’t facts. Until I get them, I’ll hold out in hopes they arrive. All I offer now is some, somewhat mysterious, and marvelous footprints that appeared out of the blue in an unfamiliar neighborhood. It has to be obvious to anyone who lives in that area that SE Foster Road runs through the neighborhoods of Foster-Powell and Mt. Scott-Arleta.